My boxes from Osaka have arrived and in my attempt to fit everything into my current storage compartments I have come to the sad realization that my clothes + hubby's clothes + Rs clothes = I need to do some serious clothes discarding. It's a bit sad to throw things away. Even the glittery top I've never worn but had so much potential when I first saw it in the shops, or the tutu skirt that fulfilled my childhood ballerina fantasy, or the leopard fur coat that I snagged for a steal at the local night market that made me feel like a rock star. All the fashion possibilities or statements I wanted to make that sadly can longer be tolerated in my limited wardrobe. However, all those, I have been able to withstand without so much as shedding a tear, but when it came to the mountain of clothing R has accumulated in his 1yr and 8 months on earth, my heart couldn't help but skip three beats each time I decide to toss a piece. Like the quilted pants circa winter 2012 that now had a hole on the knees due to exceeds crawling; or the eggplant and pea beanies that no longer fit on R's toddler sized head. Every piece if clothing item had so much memory and sentiment attached to it that I'm finding it near impossible to discard. I believe it's time for me to initiate my 'make a quilt blanket out of your children's clothes' plan. 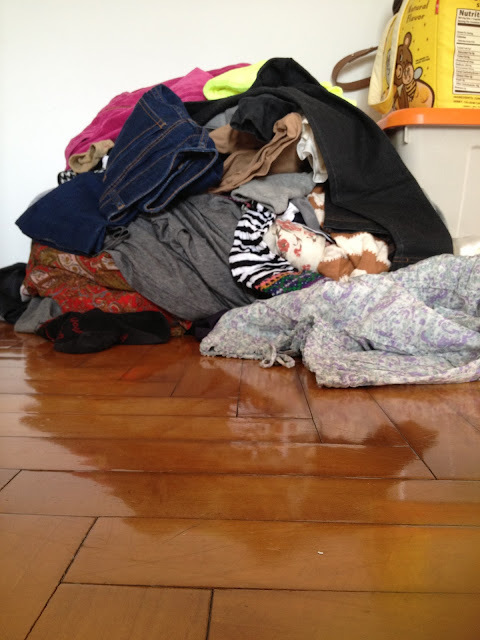 Donate the clothes! TO ME! Or you know a clothing bin. Or start an e-bay store... You are so fashionable... I`m sure someone (hint hint nudge nudge) would buy stuff!